In the summer of 2013, Brookfield Office Properties acquired the two-tower, 2.5-million-sf Wells Fargo Center, in downtown Los Angeles, as part of a four-building portfolio deal with a $450 million price tag. At the time, Wells Fargo Center was one of L.A.’s primo office addresses. But while its Bunker Hill neighborhood has emerged as a hub for creative business professionals, the two-tower complex has been showing its age of late, and has had a tougher time attracting new companies with younger tenants. “The environment was dated,” Bert Dezzutti, a Senior VP for Brookfield Office Properties, the building’s landlord, admitted to the Los Angeles Times. To help change that perception, Brookfield last April kicked off a $60 million makeover of the Wells Fargo Center’s atrium, between the 54- and 45-story towers, to include full-service restaurants, plaza seating, fast/casual dining options, a rooftop deck, tenant lounge, concierge services, health and wellness amenities, and an indoor-outdoor bar. All of these features are being added to lure the 5,000 employees who work in that building and the 40,000 who work within Bunker Hill. Skidmore, Owings & Merrill, Wells Fargo Center’s original designer, designed the new atrium, dubbed “Halo,” which is scheduled to open next year. To further accentuate the building’s hipper vibe, Brookfield on November 15 introduced Launchpad, a contest for innovative startups, whose winner will receive free office space within Wells Fargo Center for 24 months, a prize with an estimated maximum retail value of $360,000. Companies have until December 31 to submit their entries online at http://Launchpad.BunkerHillDTLA.com. Entrants must be U.S.-based, and new businesses with no more than $5 million in annual revenue in either 2017 or 2018. An entrant must provide information about the company—including its address, history, principals, contact information, and at least one social media profile. It must also submit an essay of no more than 2,000 characters describing its background, purpose, and culture, and how it believes it would benefit the Bunker Hill community. Entrants can supplement their essays by uploading a video of no longer than two minutes in length. 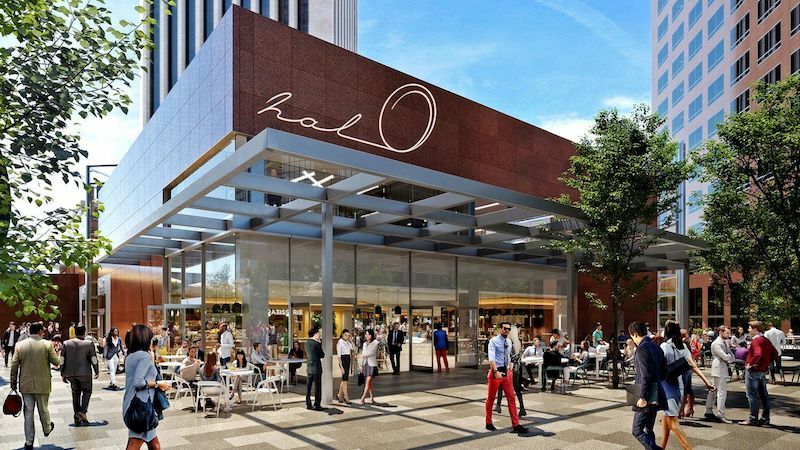 The refurbished atrium, dubbed Halo, will offer a welcoming street-level connection where previously there had been none. Image: Brookfield Office Properties. A panel of judges, selected by Brookfield, will evaluate the contestants on the basis of the their respective business objectives and prospective benefits to the community, how the entrants complement the downtown L.A. and Bunker Hill culture, and the creativity and originality of their submissions. Occupants would be entitled to exclusive, badge-protected access to the WorkSuite, a fully-furnished office space, state of the art technology and high-speed WiFi, an open kitchen with a nourish café, a monthly community lunch prepared by the building’s onsite executive chef, facilities maintenance, and mail delivery. To encourage entries, Brookfield has been offering brokers a $10,000 commission if one of their clients is selected for the Grand Prize.